A few days have passed since the HURT 100 and I finally have a little bit of time to write and enough water under the bridge to allow me to write with a little bit of perspective…. It was a very tough day but I am confident that I will be able to apply the lessons I learned out on the trails that day. Pauline–Awesome as always! She can always make me smile and knows exactly what I need and when I need it. Because of her, I am able to run with a smile on my face and a calm yet competitive soul. I will also never forget her laugh once she realized that the background in the paradise park/lap 2 photo is slightly inappropriate (Ahoy Matey!)…classic! She is a photoshop master, but that non-doctored photo may be her masterpiece. Nice job princess! Erik—Flew all the way out from Norcal to help out and hang out. Sorry about dropping out of the race early, but at least that meant we had a day on the North Shore instead! Jeff & Shelby—Thanks for offering up your time to pace me in the later laps. I promise that next time, I will utilize your pacing services—Or maybe it will be me pacing/crewing you guys at a future HURT? John & PJ and their team—Wow! Truly amazing people delivering a truly amazing experience. I now feel like I am a part of the HURT community and I am looking forward to more HURT trail races and training runs. Hannah– Were you at every aid station? Thanks so much for helping Pauline out, filling up my pack, and kicking me out of the aid station. Fish & Phil @ Paradise Park–Another Wow! I was starting to get a little overheated and these guys really took care of me. Fish pulled out a rag soaked in ice water, put it on my head/neck, and proceeded to massage my head/neck to help me cool down. These guys were total pros and are the definition of Aloha. There are so many more people to thank–over 300 volunteers, all the amazing runners that I met out on the trails, and the incredible crews that we encountered at the aid stations. Everything about this event was top notch and I am supremely grateful and humbled to be a part of it. The race start in the dark was amazing. Running/hiking up Hogsback for the first time in the dark actually made it feel a bit easier. I started in the way back in order to keep myself from going out too fast and I just chilled and felt relaxed the entire lap. I found myself surrounded by HURT 100 veterans like Rosie Warfield, Ken Michal, and Steve Clemons late in the lap. I was strong hiking all the climbs and running where possible on the flats and downhills. I was also running super-conservatively on the downs–I did not want a rolled ankle to make a tough race even tougher. I was sweating a ton and drinking quite a bit as well. I was filling the bladder in my Nathan pack wth Skratch Labs drink mix with one exception that I filled the bladder with just water. I think that was a mistake that may have cost me big time. Next time–all Skratch. Potatoes were awesome and I ate fruit at the aid stations along the way. My splits were 1:50 & 52nd place at Paradise Park, 3:10 & 45th place at Nu’uanu and 5:03/39th place after 1 lap at the Nature Center. That first lap was a little quicker than expected. It pretty much hit my “best case scenario” lap time right on. As I was leaving the Nature Center to start lap 2, I told Pauline “the good news is that I now have 31 hours to run 4 laps”. I was in very good spirits and feeling good. I felt like I was ahead of pace so I really focused on relaxing on the climbs. I was starting to get pretty hot and my awareness of the situation caused me to slow down a little more. I hit Paradise Park 13 minutes slower than the first lap but I was still in 39th place. One of the focus points for me all race was to just be happy. I was determined to not hit a bottom–this is actually a goal for my entire 2014 racing campaign and I have to say, that along that front–mission accomplished! At Paradise Park, Fish and Phil cooled me down and Pauline kept me focused with a big smile on my face. On the way back up the climb, I started to experience some slight muscle cramping coupled with some less-than-fun dry heaving. I pretty much walked/hiked a lot of the way down to Nu’uanu and hit the aid station @9:06—about 7 minutes slower than the first lap. I was in 49th place when I crossed the stream and was greeted by Pauline and Erik. At Nu’uanu, I did a full clothing change and Pauline even changed out my socks for me. My toes were a bit banged up from hitting a few rocks and roots and the new socks felt great. The dry clothes were a smart move as well. My clothes were saturated with sweat and with 82% humidity, the liklihood of that sweat evaporating was zero. I took my time at the aid station, used the restroom, and totally refilled everything. I let Pauline know about the dry heaves/cramps and I left the aid station ready and excited to keep the journey going. It was about 3:15-3:20pm when I left the aid station—plenty of time to get to the Nature Center without a headlamp….Right? On the climb out of Nu’uanu is pretty steep, nasty, and rocky. About halfway up, I started feeling much worse. I needed to take a little time to regroup so I sat on a rock along the side of the trail. Big thanks to all the runners passing in either direction that checked up on me (this is one of my favorite parts of the Ultra Community). Once I got up from the rock, I kept hiking up the climb and the cramping/heaving became worse. I was now starting to do some math and hoping that I could make it back to the Nature Center without a light. My thoughts were that if I could keep moving with no stops, that I would be fine. Once I reached the top of the climb, I tried to run whenever I could. I stayed positive and focused on the task at hand. Once I reached the Manoa Cliff trail (one of my favorites) I hit a pretty nasty bout of dry heaves that failed to stay dry. Yep, that was not fun and it looked like I completely emptied myself of all calories that I had consumed over the previous 10+ hours. I lost valuable time on the side of the trail and I needed to get my tail moving in order to get to the Nature Center before dark. I made sure that mentally, I focused on moving forward but I know that I would need to take some time at the Nature Center to feel better if I was to continue this quest. I landed at the Nature Center around 6:30p. The time listed on the ultralive is 8:02p and that is the time that I officially dropped out. My split time for the 2nd lap was around 7:30. As I rolled into the aid station, volunteers jumped to help me get filled up quickly to get me out on my way. I had to slow then down to let them know that I was having some difficulty and that I would need to set up shop there for a bit before I continued on into the night. I shared with Pauline and Erik the difficulties that I was experiencing and we sat for a while and tried to get some calories back into me without me heaving them back up. I changed into dry clothes, sipped miso soup, and chatted with my crew as well as other awesome individuals chilling at the Nature Center. Once I started feeling a bit better, we started to do some math to see if finishing was a realistic possibility. It was decision time. I was still a very happy guy but I was facing a rough decision. I have never DNF’d an ultra and that thought alone was making me sick. I would have needed to run 3 laps averaging 7:20 per lap in order to finish under the 36 hour cut. I did not think that was realistic and I was not up for beating myself up for 40-50 more miles of cramping and heaving to still not finish. I have a lot that I want to accomplish in 2014 and ultimately we decided that the smart move was to drop out of the race. I notified PJ and John with heavy heart that I was dropping out. PJ did her best to make me feel a little better by saying “we all have dropped out of this race at one time or another”. We packed it up, headed home, ate, and slept a big sleep. By the end of the race, 53 of the 130 entrants finished the HURT 100 under the 36 hour cut time. Now that a few days have passed, I am happy with my decision. I am actually back to running and I am evaluating why I experienced the stomach issues that I have never experienced before. I think I may have felt awful due to a possible electrolyte imbalance in my stomach. I am used to just drinking my Skratch–maybe the bladder to just water was too much without any salts/sugars. We will find out more in training. My hip feels ok and I am excited to get back to training. I now need to figure out if/when I will get my qualifier for the Western States 100 2015. As for now, no more race planing until after Pauline and I get married at the end of February. I am just going to train and look forward to getting married! June 7 North Face 50 Miler in Washington DC–Pauline will make her ultra debut at the 50k event! I will also get out for most/all the HURT trail series because of the amazing experience that I had with the group at the HURT 100. Also massive thank you to HURT staff, volunteers and ultra community. We saw some old friends and made many new ones. Appreciate greatly all the help we received along the way and words of wisdom that made our decision, while difficult, the right one. 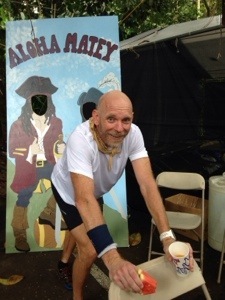 Michael came through Nu’uanu at 3:10 pm completing 32.8 miles so far. He got a complete outfit change and some snacks before heading out. Mahalo to the Brown girls for letting us borrow Erik! We’ll update again from nature center @40 miles. Apologies for the late update, team garrison was on airport shuttle duty picking up uber important crew member Erik! Michael came through Paradise Park at 1:15 pm. We’re waiting to crew him at Nu’uanu to close out 32 mi! Michael came into Nature Center aid station at 11 am ahead of schedule. He changed garmins and is on his way out to Manoa. Michael came through 12.8 mi at 9:10 am. He’s headed back to Makiki to close out the first 20 mile loop. 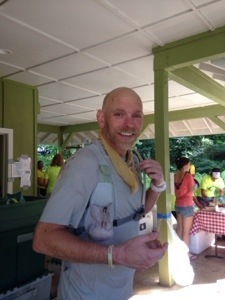 Michael came through the first aid station at paradise park in 1 hr 50 min, completing 7.3 miles so far. Thanks to HURT 100 staff for updates on ultralive.net! Next stop Nu’uanu! 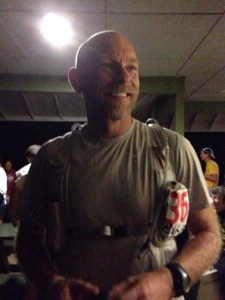 Michael started the 100 miler just about a half hour ago at 6 am Hawaii time. All three drop bags were stocked last night with extra clothes, towels, socks, potatoes, skratch labs drink mix, and a variety of run essentials. Team Garrison will crew at Nu’uanu (crew not allowed at first aid station for the first lap) and will update at that time. Huge mahalo to Jeff for being on parking duty this morning and for always bringing humor to ease the mood. 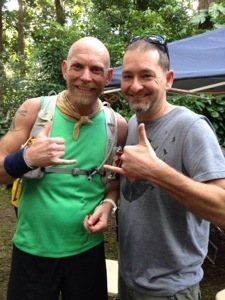 The time is almost here….less then 36 hours away from the 6am start of the 2014 HURT 100. This will be my 3rd 100 miler but the HURT will certainly be the toughest race that I have ever attempted. I am going into the race with the goal of being one of 50 or so finishers that complete the course under the allotted 36 hour cutoff. I am heading into the race almost healthy (my right hip still gives me occasional issues) and I have been able to avoid all the flu/colds/strep throat issues that have been bouncing around this winter. My mileage has peaked at 70 miles/week and I am heading to the starting line a bit under-trained. Better to get to the start line a little under-trained and healthy than to show up over-trained and injured. I am excited, nervous, terrified, relaxed, curious, and grateful to have this opportunity. I am also extremely grateful to have this opportunity to race at home with many friends around to help Pauline crew and support along the way. The race consists of 5 20 mile laps filled with rocks, roots, mud, and 5000 feet of climbing per lap in the beautiful rainforests of Oahu. Pacing duties will start around 5pm on Saturday or 60 miles into the race and will be handled by Jeff and Shelby. I will be using multiple Garmin GPS watches to make sure I can get all 100 miles covered and mapped. I have been uploading my training onto Strava.com and it has been a great way to reconnect with some old friends and gain tons of inspiration from friends, peers, and runners that I truly admire. What an outstanding tool! I am hoping to keep my laps all in the 5-7 hour range in order to finish under the 36 hour cutoff. Thanks for all your support and a big Aloha to all the HURT racers, crew, and volunteers this weekend!